The goal is to restore the 25th St. Theatre to better-than-new condition. The facility will be enhanced to re-purpose the 25th into a venue that will be not only a motion picture house, but will be enhanced to provide versatility for use as a community arts and events venue. The vision is to make the 25th into a multipurpose facility available to and for the benefit of the entire Waco community; for the 25th to become a cultural center. 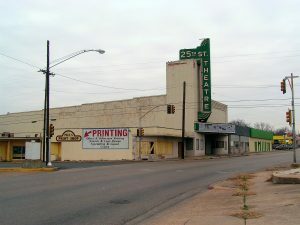 The 25th St. Theatre will once again be the shining star of 25th Street and the Sanger Heights neighborhood. The 25th will retain the traditional projection capabilities for film, including 16, 35 and 70mm formats. The exact model of the 35/70 mm projectors have already been procured and stand waiting for installation in the 25th’s projection booth. Current day state of the art digital projection capability will be added. The stage area will be expanded with support areas including dressing and green room spaces along with wing space to facilitate presentation of concert and modest stage performances. State-of-the art lighting and sound system plans are being developed. The seating plans are not finalized, however, vintage theater seating has already been obtained and are in the process of being restored by the local craftsmen of the Southern Furniture Company of Elm Mott, Texas. Preliminary architectural concepts have already been developed. The concepts are the starting point for ongoing studies to develop the final plan to maximize the utilization of the 25th St. Theatre.